I’ve just been reading a really interesting article by Matthew Kirschenbaum about issues re preserving computer software for the future. I’m a former computer scientist, and now academic historian, and this is a subject dear to my heart. On a very personal level I’m painfully aware how much recent software no longer runs on modern computers, and that’s just from the last decade and a bit more. Extrapolating out to more decades and even longer raises the issues still further. Anyway I would strongly recommend that others with an interest in these issues read the article. It’s remarkably wide ranging. For example there’s quite a detailed discussion of the pros and cons of emulators versus original hardware, including a rather nice analogy about 18th century reading habits. Also addressed is which software should be saved – see also the companion piece about this. There’s also the alarming revelation that the US Library of Congress didn’t generally preserve computer magazines before 1990, regarding them as too ephemeral – aarrgghh! Blog about 24 hours at the recent SHARP book history conference at Philadelphia. 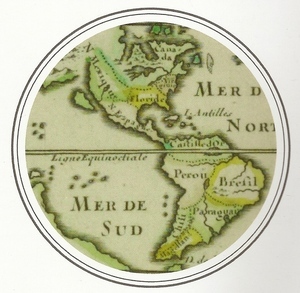 I’m particularly intrigued by the talks about maps within books and mapping events within books. Wish I’d got to those! During the all too short time (about a day’s length) I was able to be at the Sharp conference this year, held at the University of Pennsylvania, in Philadelphia, I enjoyed myself and heard some engaging informative papers — and gave one myself. Although I was able to attend the conference only briefly (as my husband was still recovering from an operation), I would still like to remember and share the gist of what I heard and experienced (as I did two years ago) and what I wish I could have been there for. I arrived on Saturday, July 20th, around 2:00 pm, in time to attend two panels and in the evening go to a scrumptious banquet (at which there were Philadelphia mummers) and walk around the campus. A shadow library of lost books? 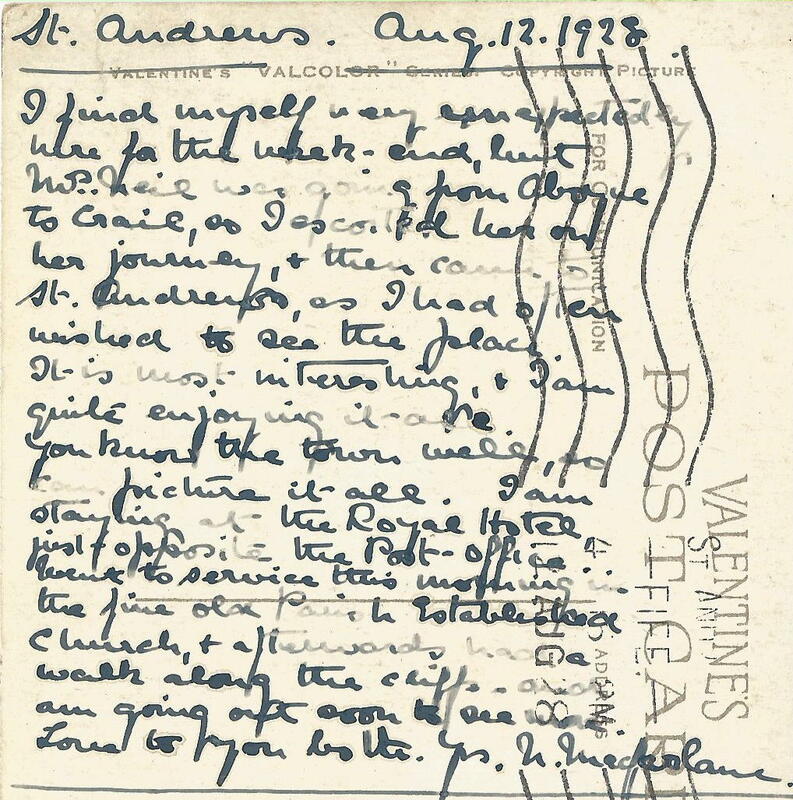 Fascinating blog post from Glasgow University Library about a project at St Andrews that’s tracing references to lost books, using documentary evidence, catalogues, inventories etc. There will also be a conference about this at St Andrews in June 2014. I intend to be there. I recall reading somewhere that books survive in greater numbers than just about any other human-made object (the exception being coins). And having passed the last couple of hours buried beneath an ever-increasing mound of hefty hardbacks searching (in vain) for the source of this claim, it certainly sounds plausible to me! Yet despite the large number of bibliographic survivors (our Special Collections department alone holds in the region of 200,000 printed books, with the same again in manuscript items) many many more books have been lost over the years. I’ve downloaded a lot of digitised out of copyright books in PDF form. The Internet Archive is a particularly good source for these. But some older books are not available there, but they are available in print on demand reprint. This includes a large number of British Library books, which were digitised in conjunction with Microsoft, and later made available as print on demand through Amazon’s CreateSpace service. I’ve just been looking for an old history of Selkirkshire, a two-volume book by Thomas Craig-Brown which was originally published in 1886. I’d like to look at this again – I last peeked at it briefly in the 1980s – because I believe it has some interesting things to say about one of my most characterful ancestors. But neither university library nearby has a copy, and it hasn’t been digitised as part of the Internet Archive. But it is available as print on demand through the British Library / Amazon collaboration, which would allow me to read the text. I found a secondhand copy of the 1886 original, but at 500 pounds I won’t be buying it! The problem is I can’t tell by looking at the Amazon listings for the print on demand books what I’d be buying. There are two listings for this title, both described as “The History of Selkirkshire; Or, Chronicles of Ettrick Forest”, “published” one month apart. I suspect they are volume 1 and volume 2 of the book (possibly the other way round), but the page counts don’t exactly match the printed original volumes clearly, and there is no indication of volume numbers on the Amazon listings. So I’m really not sure. I’ve asked Amazon to check for me. They can surely look at the source files. Or pick up the print on demand copies lurking in warehouses and have a peek. What I don’t want to do is guess and buy blind. At least this book was only published once, so I’m not worrying about which edition I’m getting. But the bibliographic details on the Amazon site for these print on demand books are extremely poor and uninformative. I’m not very impressed, wearing my book historian’s hat, plus wanting to make a canny purchase. But hopefully Amazon Customer Services will be able to sort out the query for me. I’m building up a collection of old postcards of places that are important to me. 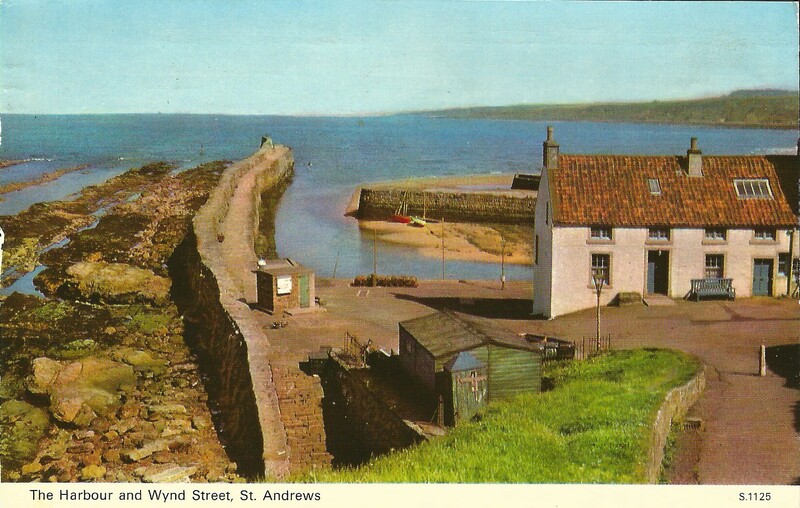 I lived in St Andrews from 1990-1994, and holidayed there most summers throughout the 1980s. 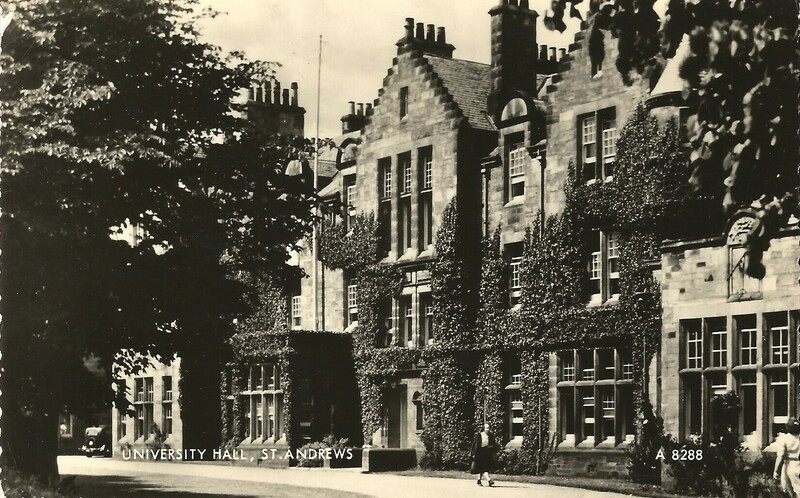 And after my husband and I graduated from St Andrews University, and married soon after, we were determined that we would stay living in the near area, which we’ve managed to do. My three latest postcards cover a range of dates from the 1920s through to the 1970s, the latter not long before I started my childhood holidays there. 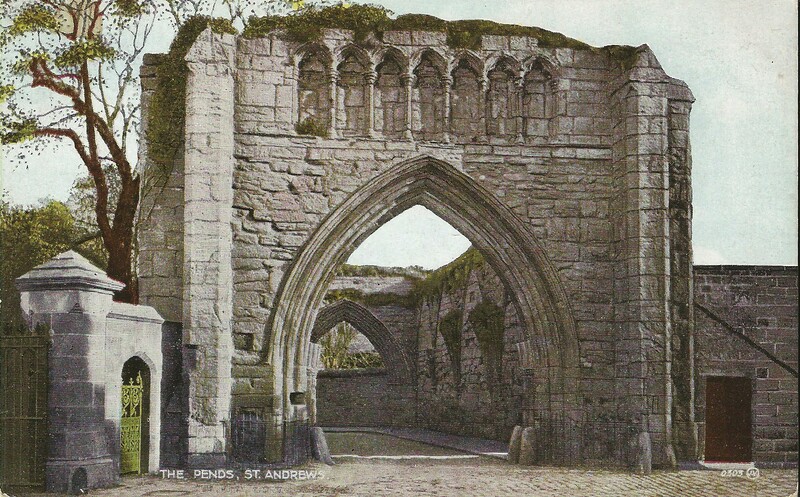 The earliest, dated 1928, shows The Pends at the end of South Street, near the Cathedral. 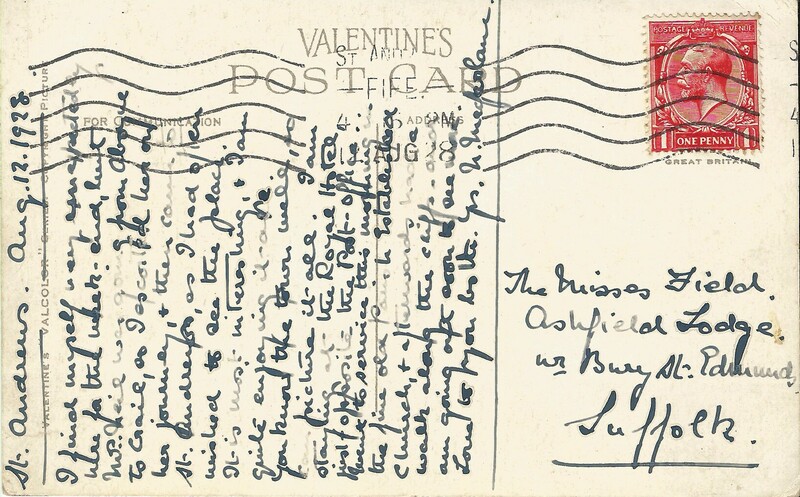 This is a pretty postcard, coloured, and has a nice note on the back. The next chronologically, dated 1965, shows University Hall, the hall of residence on Kennedy Gardens – then for female students only – which I stayed in during 1990-1991. It shows the older part of the building, the prettier bit, not the modern wing I stayed in. 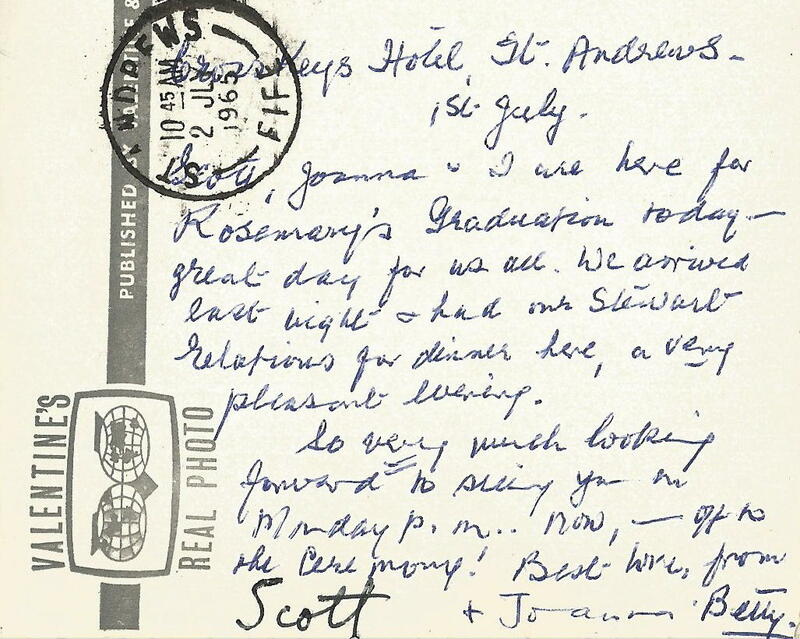 I like that the postcard writer was up in St Andrews for a graduation. I wonder if the graduate had stayed in University Hall. 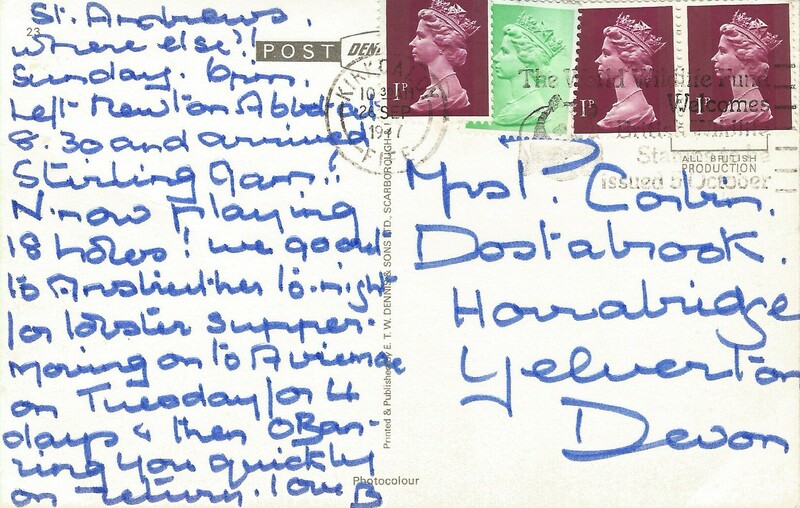 The third postcard is from nearest to my time, 1977, and shows the view down to the harbour. Again there’s a note on the back, which I’ve scanned in here. If I have a choice between two otherwise identical postcards, one that’s been used and one that’s been unused, I’ll go for the used one every time, because the note is always a nice example of social history. I originally posted this on my general genealogy/ancestry stories blog, but I think it, and any more future personal postcard posts, would be better suited to my academic historian’s blog. So reblogging here. I lived in Cupar from 1995 to 2001. It was the first proper home I had with my husband. We lived in a flat in Cupar Mills, which is a converted old mill building on the Millgate, with massive thick stone walls. I looked into some of the past inhabitants of the building, in 19th century census returns, and valuation rolls, and got quite interested in the local history. 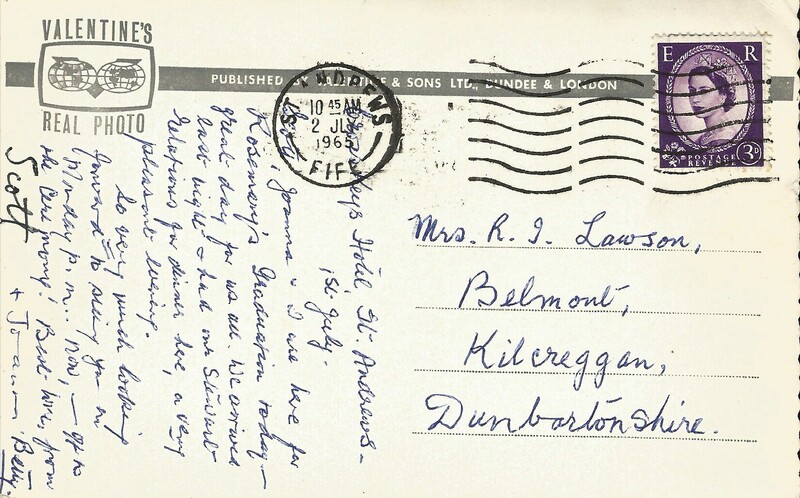 So I have a soft spot for Cupar, and keep an eye out for interesting postcards. And I’ve just bought three, all looking as though they date from the early 1900s. The first, postmarked 1919, shows the River Eden, near the old Gaol, which later became a pub where we often ate high teas.